Hey y'all! So I am so excited as Fall is one of my favorite seasons and I have decided to officially create space for all my Fall favorites in one section of my Blog so you can easily save and shop your favorites too! Every Friday through this season, I plan to release one of my current favorites, that I just can't live without this time of year. It will range from home décor, to sweater weather essentials, scents of the season, beauty products, travel and more. So who's ready to get into pumpkin spice and everything nice vibes?! 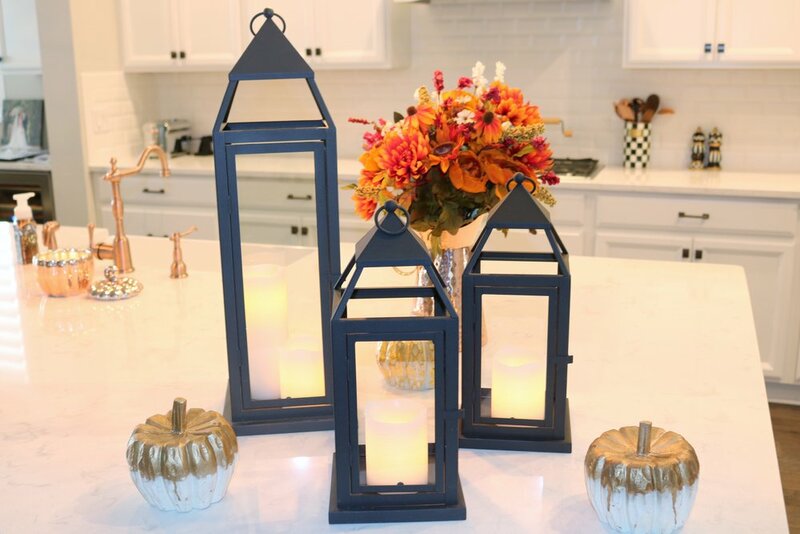 I'm kicking my first "Friday Fall Favorites" post off with these GORGE Front porch lanterns with LED candles that I found for less than $50 at Pier 1! They are on sale at pier 1 and are currently a FRACTION OF THE COST of some very similar ones from Pottery Barn. The nice thing about them is they are made from materials that are not supposed to rust, so they're perfect for the outdoor festive Fall porch display. I plan to use mine in my display at Christmas time too--I might fill them up with whimsical ornaments! The LED candles flicker and feel like real ones, and you are able to program them to customize exactly how many hours they turn on and shut off, or you can pick from their standard set incremental hour time frames. I only paid $30 for the large lantern as compared to $100+ at Pottery Barn and others for almost identical lanterns. I ended up paying around $100 total for my display actually and they're doing a Columbus weekend sale. I'm linking them and the candles in the product image (widget) below. Just click to shop! SIzes shown in my display are the Landen Large and the Landen Small. USE CODE BIG25 AT CHECKOUT THROUGH THIS WEEKEND FOR AN EXTRA 25% OFF TOO!! PS-found these Cinderella Pumpkins at Fresh Market if you were wondering...aren't they adorable! Last, I didn't want to spill the beans buuuttt I'm so proud of how my porch turned out for my first time decorating our new house for Fall that I can't help it! Sooo..stay tuned, because in the near future, by popular demand, I will have a full post on all of the front porch Fall decor details and where to shop everything. I've leaked a few pieces like these lanterns, a DIY pumpkin trio stack (Link to post also here), and the door mat in previous posts though so head to my Instagram account @whoisvictoriataylor if you missed it and want to shop those deets! Happy Harvest for now loves!